An FAQ page is an important tool for both website owners and visitors. It solves the common queries of many customers about products/ services that the website owns. Additionally, it is good for site owners, as they don’t have to respond to the numbers of individual queries and concern about the products/services. 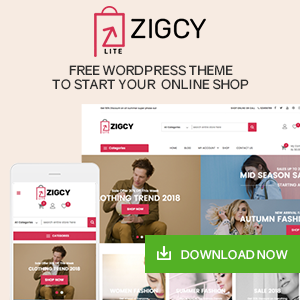 Besides, an FAQ page can also act as the guideline for your potential customers and give them a required push for making a purchase. Why should you add FAQ Section on your Website? A well written and organized FAQ can be a perfect reference to for your customers. It will allow them to quickly find the answer to their questions. Hence, they won’t have to mail you all the time to get their queries/concerns solved. Normally, most of the people have concerns about whether the product, they buy is legitimate or not. Through FAQ you can connect with them, and as you are sharing the information about the product publicly, it will generate trust factor between you and your customers. FAQ pages can be used as an integral part of the site navigation as each of the questions can be hyperlinked to a relevant product, service or page within the site to redirect the customer. An FAQ page can be an excellent SEO tool. It is because search engines normally scan the keywords and key phrases of a website. So, if you insert the keywords and key phrases on the questions and answers on your FAQ, it will increase the SEO flow of the entire page. Hence, a good FAQ page containing keywords and quality contents may boost the search engine ranking of your website. A good FAQ page can increase the conversion rate of your website. It is because an FAQ page consists the information about the products/services publically, it can make your visitors comfortable with the product/service and may persuade them to make a purchase. Now lets about some of the Best WordPress FAQ Plugins that can be found on the internet. 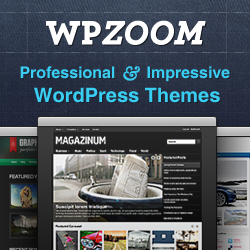 They are very popular and are compatible with the latest version of WordPress. 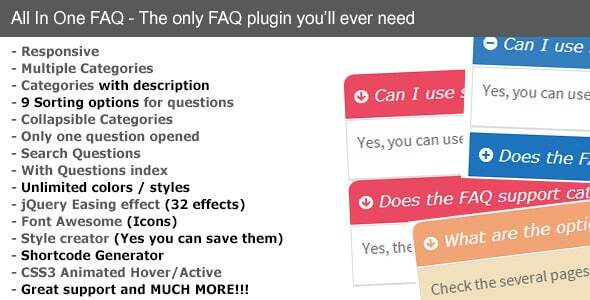 Also, these plugins come with lots of configurable options to create a stunning FAQ page. If you are looking for Free WordPress FAQ Plugins then check out our collection of Top 10 Best Free WordPress FAQ Plugins. 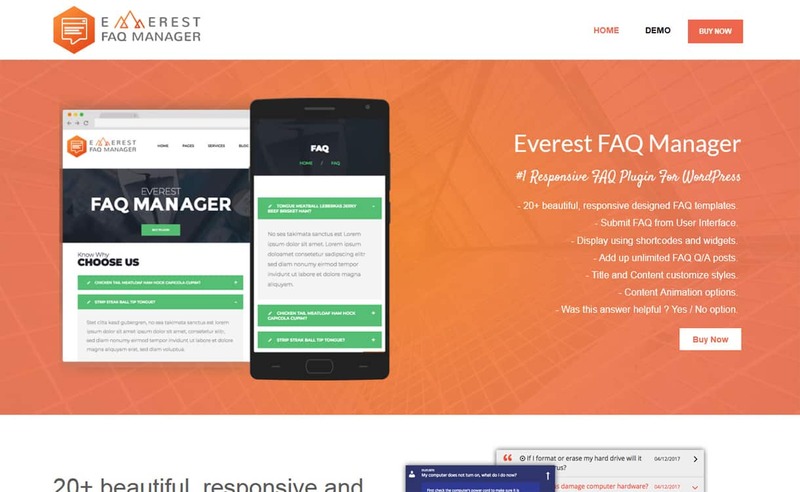 Everest FAQ Manager is a perfect WordPress FAQ Plugin to showcase FAQs on your website. 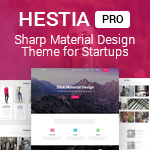 It comes with 20+ beautifully designed layouts to match the FAQ with your website. Besides, the plugin comes with FAQ builder that allows you to add unlimited number of FAQ and configure it to the most. It is a shortcode and widget ready plugin that allows you to place your FAQs anywhere on your website. Moreover, the plugin comes with many other options such as FAQ ratings, like dislike buttons, FAQ submission button etc. 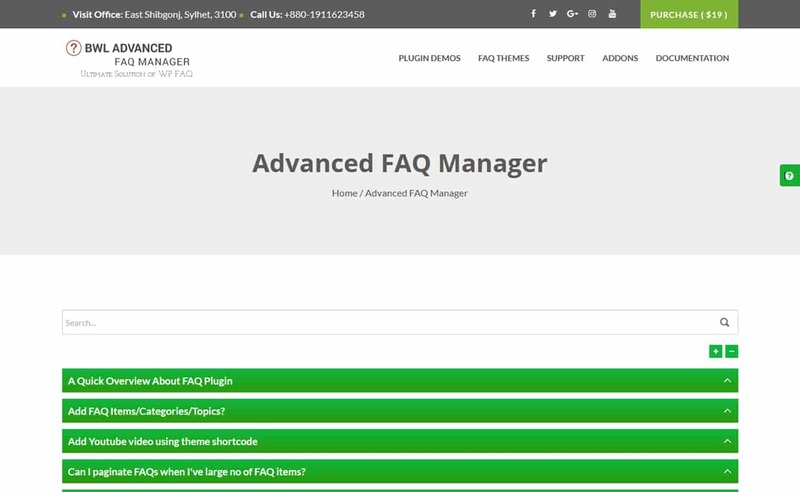 BWL Advanced FAQ Manager is a perfect FAQ WordPress Plugins for creating a stunning FAQ section on your website. 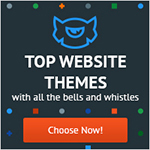 It comes with 7 predefined themes with theme builder options. 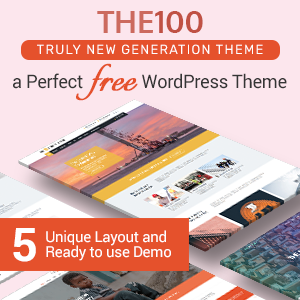 Hence, using the plugin you can create your own custom theme for your FAQ posts. 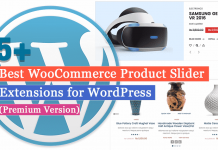 It is an easy to use WP plugin that contains simple configuration options. 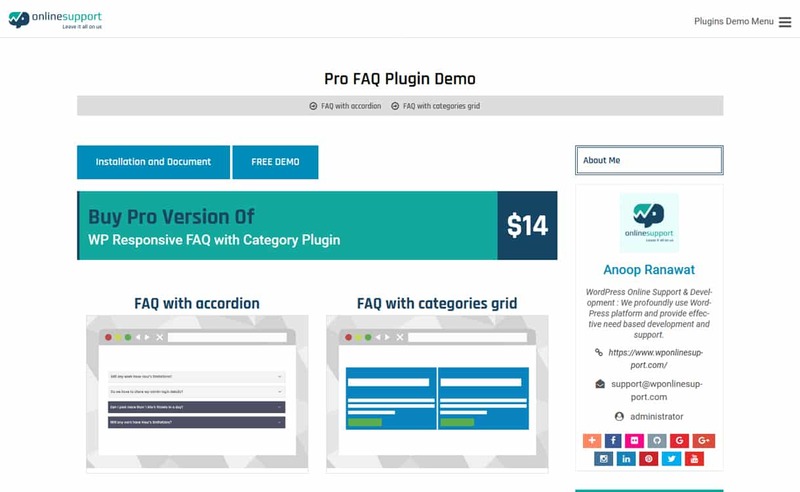 Besides, the plugin also comes with unique live FAQ search and unique FAQ accordion with the pagination system. FAQPlus is an ultimate FAQ Plugin for WordPress that contains highly customizable CSS for every FAQ group. It comes with 25+ animation effects to customize your FAQ posts and display them anywhere on your website with the provided shortcodes. It is a highly customizable plugin that has unlimited color variation and FontAwesome to display your FAQ in more clean and standard way. Additionally, the plugin also supports texts, images, videos with drag and drop to reorder the FAQ items. All in One FAQ is a Premium WordPress FAQ Plugin that allows you to create and add multiple FAQ posts on your website. It comes with multiple categories and style for sorting your questions in different styles. It is a highly configurable plugin that comes with unlimited colors and styles to customize your FAQs. Besides, the plugin also supports 32 jQuery effects and FontAwesome icons to make your FAQ look stunning. 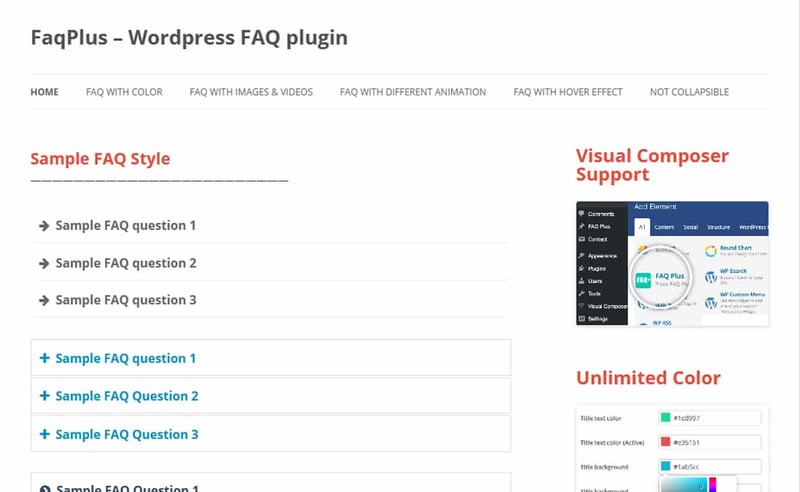 WP FAQ Pro is a Premium WordPress FAQ Plugin that allows you to easily add, manage and display on your website. The plugin is created with custom post types and can be posted anywhere on the website using generated shortcodes. It comes with 15 pre-designed layouts for displaying your FAQ. Besides, the plugin can be categorized and reordered without any problem using drag and drop interface. 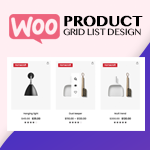 Moreover, the plugin is compatible with WooCommerce. Hence, you can WooCommerce product FAQ with ease. A product or sales page is a perfect place for an FAQ section. It is because your potential buyers may have pre-purchase queries and if they can if find their answer right away, you will get an excellent chance of making the sale immediately. You can find lots of WordPRess FAQ Plugins on the web. But choose the right ones with suitable features would be time-consuming. So, help you find a perfect FAQ Plugin I have listed only the best ones that contain simple features and are suitable for any types of WordPress sites. You can also go through our other list of Best WordPress Pricing Table Plugins. Next articleHow to Promote Your WordPress Website “Offsite”?